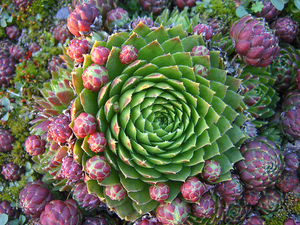 description for "Cacti and Succulents: jovibarba sobolifera"
The Rolling Hens & Chicks are close kin to the familiar Sempervivum, but with round ball-shaped chicks that roll off from the mother plant to find a new home. This variety of plant produces small, bright green rosettes, with chicks like tiny little red balls sitting on top. Short spikes of pale yellow flowers appear in summer. Terrific in a rock garden, rock wall or alpine trough. Short enough to use between flagstones in a walkway or patio. Very adaptable, growing nearly anywhere but in deep shade. This Plant is Native : Bohemia and Poland. The name Jovibarba is Latin for Jupiter's Beard, apparently an ancient reference to the fringed flower petals and erect flower stalk. reviews for "Cacti and Succulents: jovibarba sobolifera"